There is something for everyone in the Buddhist teachings. Even if you are not a Buddhist there are things which you will find useful. Even if you don’t follow any religion at all. Buddhism is about changing the quality of your life and becoming a better person by changing the way you think. Learning and meditating are essential for this process. These four classes aim to give you an overview of some of the most important Buddhist ideas and practices, and to give you a taste of Buddhist meditation. These Dharma talks are suitable for all levels: those completely new to Buddhism; those who have done some independent reading on Buddhism and would like to get some of your questions answered; who have attended some classes and would like a refresher course or those who want to connect to the Dharma during this special month. Please share this course information with anyone that you know that might be interested. Variously called Shakyamuni Buddha – sage of the Shakya clan – and Gautama Buddha – by his family name from his birth as Prince Siddhartha, Lord Buddha is the Founder of the Dharma in our world age. He lived and taught in what we now call India, around 500BCE, i.e., about 2.5 millennia ago. The common view is that the Buddha attained enlightenment under the bodhi tree, in Bodh Gaya, India, when he was 35 years of age, after having studied and practiced for 6 years. However, that would be a very short amount of time in which to achieve complete enlightenment. The view of the Mahayana tradition is that he had already achieved full enlightenment prior to appearing in this world and that his actions were merely a display for us. 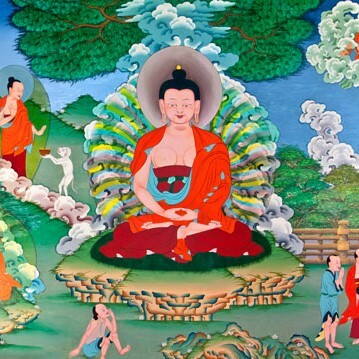 In any case, his enlightenment was the result of lifetimes of practice, detailed in the Jataka tales and elsewhere. Twelve major events of Lord Buddha’s life, including life as a prince, are depicted in the murals in the Wish-Fulfilling Temple at Land of Medicine Buddha, including his birth at Lumbini, and parinirvana (passing away) at Kushinagar, which are also remembered during the month of Saka Dawa. Buddhas—enlightened beings—benefit sentient beings by teaching the Dharma, explaining our situation and showing us how to get out of it. Lord Buddha “turned the wheel of Dharma” at Deer Park, near Varanasi, India and we are still living under the effect of his teachings today. Buddhahood is often summarized by the three qualities of wisdom, compassion, and power. The potential for each of us to attain this state is called buddha-nature. Join us in tapping into our buddha-nature this June in celebration of Lord Buddha’s appearance in our world.